Have you ever had a hankering for a s’more or even a midnight sweet snack, but didn’t have a lot of ingredients? Well, this recipe is the perfect solution. These sweet and salty treats only take minutes to make and can be made with items most people already have in their pantry. Even a poor man, woman or frugal family can use a few simple ingredients to make this satisfying treat. I remember my mom making these simple yet delicious treats for my brother and I when we were kids. 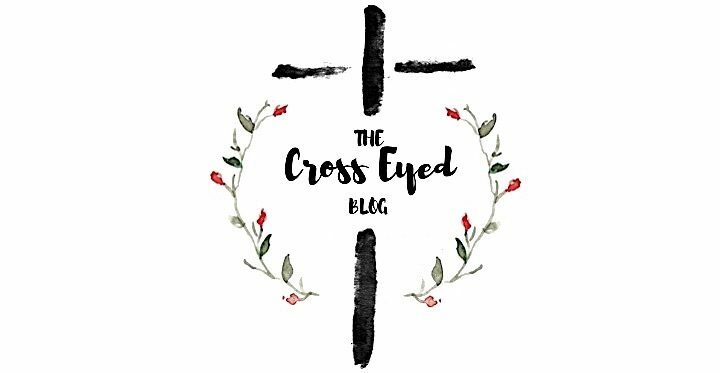 I couldn’t even begin to tell you the number of times I made them for myself during all of those late nights in college or even as a simple treat for my kids. Even tonight when I made these, my daughter, Lauren, was literally jumping up and down in the kitchen. Here is how you make them. Take a saltine crackers and spread peanut butter on the top of the cracker. Sprinkle 3-4 chocolate chips on the peanut butter. Place 3-4 marshmallows on top. Place a piece of aluminum foil in the oven and turn it on to broil. Place the s’mores in the oven and broil in the oven for only about 1 minute or until marshmallows are browned. Watch closely on this part to make sure not to burn the s’mores. Also, be very careful getting the poor man s’mores out of the hot oven with it on broil. Your imagination is the limit with this recipe. There are various spreads as well as different types of baking chips so you could create lots of different variations on this recipe. Here are some of my suggestions. 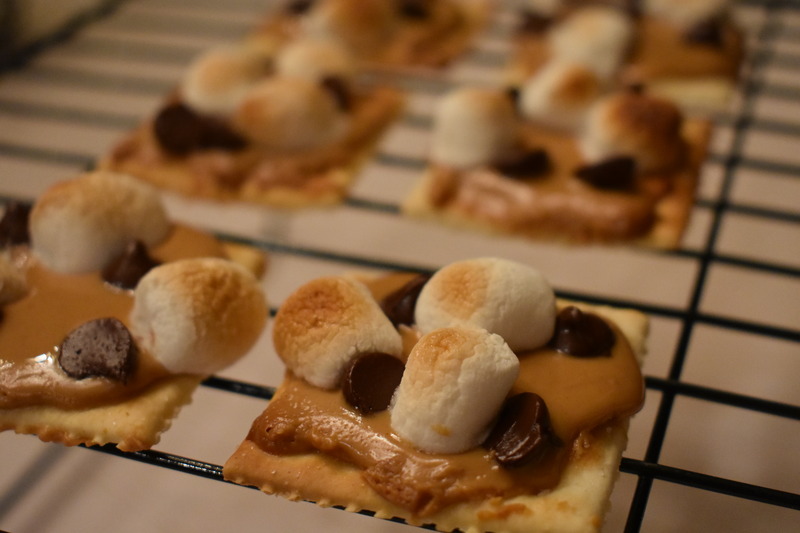 Use hazelnut spread on the saltine and top with peanut butter chips and miniature marshmallows. Use peanut butter (creamy or crunchy) with miniature marshmallows only. Use Oreo spread with semisweet chocolate chips and marshmallows. 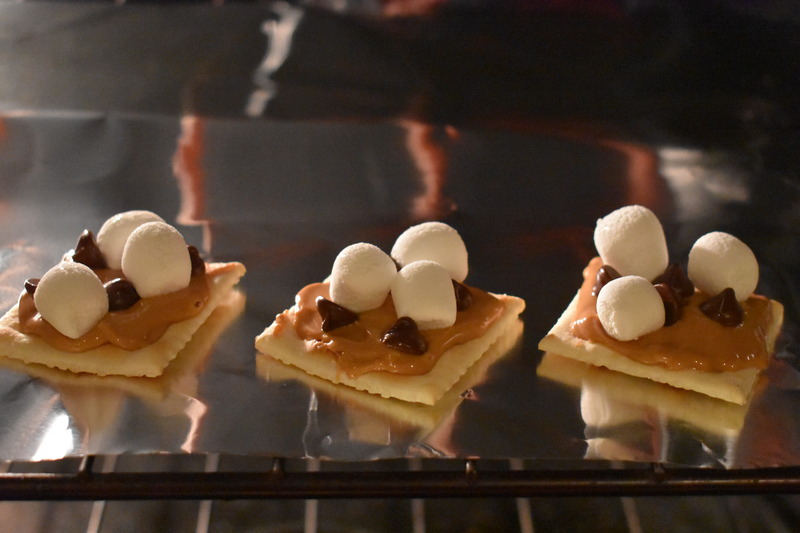 Use hazelnut spread on the saltine and top with butterscotch chips and miniature marshmallows.